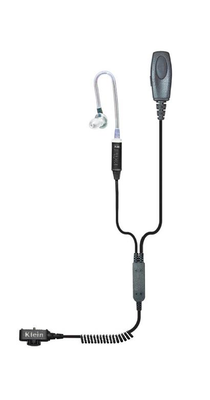 The PATRIOT PRO Wired PTT Headset includes a replaceable audio tube and earpiece for comfortable, all day use. The PATRIOT PRO’s 2-Wire design allows for the headset cords to be clipped over or under clothes or a uniform, while on the job. Klein custom designed the PATRIOT PRO headset to reliably connect to Sonim’s SecureAudio Connector on the XP5s and XP8 handsets. This allows the PATRIOT headset connector to screw into the handsets. The PATRIOT PRO headset has a large, easy to access PTT button, compatible with heavy work gloves.